Locally produced, exceptional service and all of the finest quality. JW Sargeant's - an old-fashioned, family butcher. We can prepare your cuts of meat, just the way you like them, while you wait. A friendly and helpful service, we’re always happy to answer any questions you may have about the origin of our products. Advice is available on how to best prepare your cut. A huge selection of meats and cuts. As well as the usual cuts, we pride ourselves on selling those less well-known cuts of meat, alongside offal and our locally ‘famous’ Sargeant’s Sausages. Did you know that at Sargeant’s we have our own smoker? If you like smoked meats, we’re the place to come. If you’d like to know anything about where or how your meat was produced, just ask. We have close connections with all our local farm producers. In addition, with an abattoir on site here at Stow Bridge, we know that the animals are treated as humanely as possible, from start to finish. 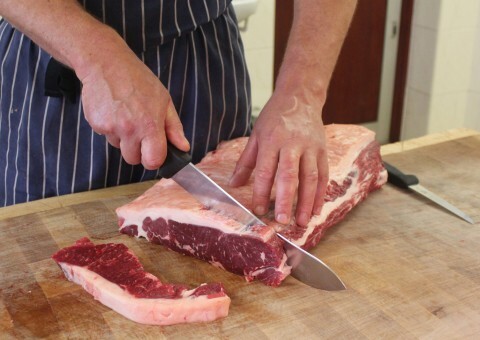 This distinguishes us from most other local butchers and all supermarkets.